Shirdi region of Maharashtra State now a days is been flocked by lakhs and lakhs of devotees from all over India. Non-residents have also not been an exception to this. 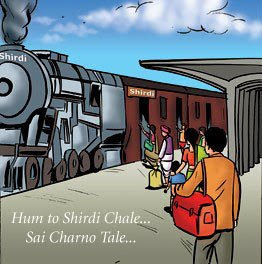 Shirdi, where there was dearth of infrastructure facilities, electricity being major of them, half a century ago, has now been facilited by direct railway line connecting it to various parts of the country. This news flashed in Indian Express, a Leading newspaper of India and it has become a talk of the town for Sai Devotees like us. Here are complete details along with the source link. The day is not far when thousands of Mumbai’s Shirdi Sai Baba devotees can directly reach Shirdi for darshan by an overnight rail journey. The work on the new Puntamba-Shirdi line has been completed. The Commissioner of Railway Safety will inspect the tracks on February 10 and the line is expected to be opened for railway traffic by the end of this month. According to sources, the Railway Board has decided that Train No 1333, which goes to Manmad, will now go to Shirdi via Puntamba. The train, which departs from CST at 10.55 pm, is expected to reach Shirdi at 7.35 pm. In the return direction, it will leave Shirdi at night and reach Mumbai the next morning. The 17.5-km Puntamba-Shirdi stretch is a long-pending project, which started in December 2003. Railways required 103.8 hectares of land for the stretch. The proposals were submitted in 2001 and the work was sanctioned. The total cost of the project is Rs 78 crore. Shirdi is famous for being the abode of Shirdi Sai Baba. Several thousand pilgrims visit the town every day and the number reaches lakhs during festival season. There is no railway link to Shirdi at present and pilgrims reach the town by road after alighting at Kopargaon, Manmad and Nashik Road railway stations. The new broad guage line, originating from Puntamba on Daund-Manmad route will provide direct rail link to Shirdi from all parts of the country.